Chihuahua Dog Breed Garden Planter - our Chihuahua dog breed garden planter is designed for outside or inside use. The perfect outdoor decor for the Chihuahua dog lover. So many possibilities of where to use - on a deck - sitting on a front step - or even in the house on a table. 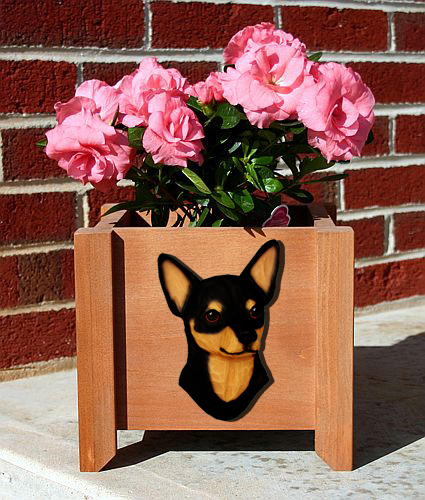 The Chihuahua Dog Breed Garden Planter is made of pine - the box is coated with a deck stain/sealer. The bottom is made of perforated PVC plastic for drainage. It features a single 2-dimensional hand painted breed head. Overall dimensions: 9 1/8" x 9 1/8" x 8". Inside dimension: 6 3/4" square. Perfect for a 6" Pot. Our Chihuahua Dog Breed Garden Planter is made in the USA.